it's been one of those kind of weeks. you know the ones that seem to run on forever. i know i shouldn't complain... i mean i get to stay at home with my children right? but, it's been a looong week. add to that my husband has been working all weekend & that i have a SERIOUS case of the dropsy's, you can imagine how much fun it's been. i have dropped & spilled: two bottles (one of which was all over the baby carrier), mod podge, glitter, stew, formula, coffee, dressing, cereal.... i think that's about it. so i've been all about cleaning things over & over again. sounds like fun right? ya. not so much. SO. with the multiple cleanings & the hubs working late.. one pot soups & stews has been the go to dinner choice around here. 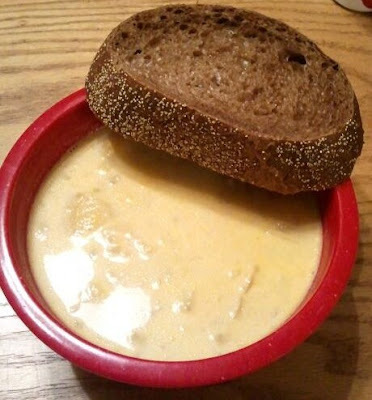 we had chicken & wild rice soup on monday. beef stew on wednesday. and beer & cheddar potato chowder friday. it's a slow cooker recipe from betty crocker. this little picture from my phone is all you get. but you can get the recipe here.